The BMW 3 Series Touring is the estate version of the majestic 3 series saloon, from the middle of the car to the front it is identical, the rear half is a nod to the bigger 5 series touring. 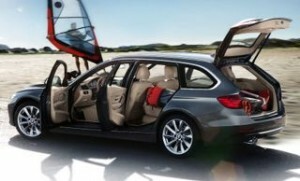 The 3 series Touring is just as engaging to drive as the saloon with the added advantage of additional storage, 495 litres with the seats up, 1,500 litres when the 40-20-40 split seats are folded, the electronic tailgate coupled with the rear tailgate glass opening independently are design features that really matter to estate car buyers. 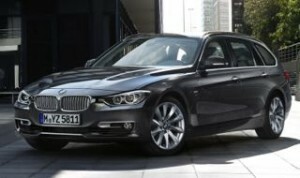 The BMW 3 series is only available to mobility customers in either ‘SE’ or Sport, the M-Sport and Luxury are not represented on the Scheme, if you have the extra cash then there are a myriad of extras you can add to your SE or Sport, which as standard has the BMW iDrive that controls the Bluetooth telephone, USB audio interface connected to the free-standing 6.5 inch Control Display with built in Sat nav, you also enjoy cruise control, multi function leather steering wheel with reach and rake adjustment, leather gear-knob and handbrake, two zone automatic air conditioning, rear parking sensors, 17 inch alloy wheels, a start stop button and all round electric windows. Sport trim adds 17-inch double-spoke alloy wheels, cloth sports seats, a sports leather steering wheel, handbrake and gear-lever, inside there’s a gloss black dashboard with red highlights, while on the outside, matching black trim. 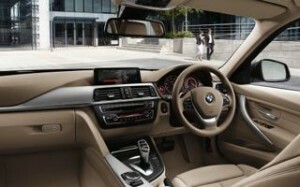 The two engines avaialble for the 3 series are both 2.0 litre in size, one petrol and one diesel. The 2.0 petrol, badged 320i, has 181 bhp and can get you to 62 mph in 7.2 seconds and return up to 48.7 miles per gallon as a rear wheel drive manual or auto. The 2.0 diesel, badged 320d, is the most popular engine choice, for good reason, it has 187 bhp with an impressive 400nm of torque giving it loads of low rev grunt and can reach 62 mph in 7.3 seconds yet return up to 67.3 miles per gallon.